We are accustomed to thinking about conflicts as two-sided contests in which one side wins and the other loses. Game theorists use the term “zero-sum” to refer to these win-lose situations, and have studied real and artificial examples of such conflicts extensively. But most conflicts evolve over time. In addition to the zero-sum scenario with its two possible win-lose endings, catastrophic double-loss and joyous double-win outcomes can happen in real world conflicts. In fact, the zero-sum character of many familiar conflicts is artificially imposed – either by the rules of the situation, as in sports, or by our own self-fulfilling contrariness in both peacetime and wartime conflicts. It is just conceivable that most human conflicts allow the possibility of a win-win outcome, if we recognize that life is not as artificial as baseball, and if we learn to examine our own bullheadedness with some patience and a will to understand. In this spirit, let’s look at one “glitch in human nature” that often leads us into trouble – enemy thinking. Adversarial conflict encourages enemy thinking. When stuck in what seems to be a win-lose conflict, people often demonize their opponent in ways that would seem irrational to an outside observer. The adversary’s faults and failings are magnified, their good qualities and their humanity is minimized, and participants in the conflict thereby prepare themselves to do such damage to their opponent that he or she will be weakened, defeated, even destroyed. The emotions that accompany this enemy thinking are so strong that combatants get visceral satisfaction from seeing their opponent humiliated and degraded. This process is familiar in contests of all kinds, from board games, to youth sports, to workplace conflicts, to the vicarious conflicts of video games and movies, to actual war and genocide. It doesn’t have to be that way. 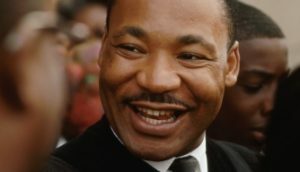 Martin Luther King’ second principle of nonviolence urges people who are in a conflict to seek the “friendship and understanding” of their opponents, not to “defeat and humiliate” them. When in a calm state of mind, most folks will see this as a praiseworthy goal. The catch is that following the principle takes some work. From a moral perspective, the second principle focuses on the common humanity of adversaries and tries to prevent us from degrading our opponents. It specifies what is really involved in “loving our neighbors,” and “resisting not evil.” Are we treating our enemies as potential friends and allies? The answer to this question tells us whether we are moving toward King’s Beloved Community, or away from it. From a practical perspective, the second principle looks ahead to a time when tempers have cooled and, as is usually the case with nations, co-workers, and family members, we must continue working with the person who was our opponent. It reminds us to keep our bridges intact rather than irrevocably burning them down. Therefore, it requires that we take conciliatory steps toward our opponent before the bridges are gone – something we are not much inclined to do when in the grip of enemy thinking. Aikido is a non-aggressive martial art in which students are trained to be responsible for the health and well-being of their opponent, and to ensure that they do no harm to their opponent beyond thwarting his or her aggression. In an aikido demonstration, you will see graceful turns and rolls rather than blows, and you will see the less adept person getting worn out more quickly than the expert – but not beaten up by assault. Roger Fisher, in his work on principled negotiation, has emphasized the importance of understanding the opponents’ interests and needs, not just their stated positions. For example, two men in a library are arguing about whether to have a window open or closed. The one who wants it open is interested in getting some fresh air. The one who wants it closed is interested in avoiding a draft. A solution (imagine it being suggested by a young woman nearby) is to open the window in an adjoining room, thereby providing fresh air but without a draft. Mathematicians have studied ways of guaranteeing that a solution to a conflict will be seen as fair to all parties. For example, two people attempting to divide a pie equally between them can proceed by having one person divide the pie in a way she thinks is equal, and then letting the other person choose the piece he wants to eat. In this way, neither person can claim that the other got a better deal. It would be desirable to teach people from an early age to seek solutions that are fair, that satisfy legitimate interests, and that protect the welfare of everyone involved. When this does not happen, it is probably because too many of us are trained to fight each other in the defense of rigid positions, and, once having begun, fight to win. Adapted from an article that first appeared in The Frederick (MD) News Post, April 5, 2008. King’s principles of nonviolence were published in his book Stride Toward Freedom (1958, 2010).